ACCION Chicago is Chicago’s largest small business micro lender, providing credit and other business services to small business owners lacking access to traditional sources of financing. Through our support of events like Taste of Accion we have been able to broaden Burling Bank’s reach and improve our ability to service members of the community who may not yet qualify for a bank loan. Moneythink works to build the financial health of Americans by equipping children and young adults to believe in themselves, navigate the financial decisions of adulthood, and achieve financial independence. Moneythink implements a unique model that gets young people excited about making smart financial decisions—in turn, generating a financial ripple effect through families and entire communities. 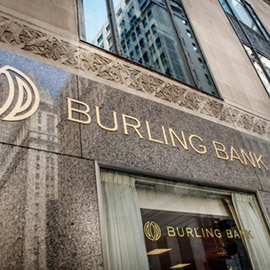 As a partner, Burling Bank provides mentoring and financial support to Moneythink’s University of Chicago Chapter, helping them educate high school students in Chicago’s most economically challenged neighborhoods. The Chicago Botanic Garden cultivates the power of plants to enrich and sustain life. This succinct, yet powerful mission is based on three core beliefs: The future of life on Earth depends on how well we understand, value, and protect plants, other wildlife, and the natural habitats that sustain our world; beautiful gardens and natural environments are fundamentally important to the mental and physical well-being of all people; and people live better, healthier lives when they can create, care for, and enjoy gardens. As a longtime enthusiast of the Chicago Botanic Garden, Burling Bank is pleased to support the Garden’s mission and programming, such as their Urban Agriculture programs that benefit the neediest communities in Chicago by revitalizing neighborhoods and providing job training.